I have heard it said that five of anything is enough and I have to agree that it is very easy to get carried away at plant sales. 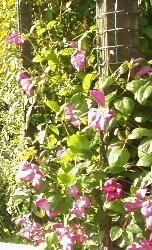 I have over a hundred clematis, far too many for any sane person so how can I possible choose just five, well I could do five Alpinas, five Viticellas etc.etc but then I would end up with 50 so that would be cheating! NO this has to be a sort of 'Desert Island Discs' . Remember that at Garden Shows and Garden Centres most of the plants have been grown under cover in ideal conditions and only the best ones selected for display. I believe that large flowering clematis owe a lot of their popularity to their ability to produce a creditable display in a 2 litre pot at one year old! Most of my choices would be the small flowered varieties as they tend to flower over a longer period and the ones I have chosen are all disease resistant - that means they do not get mildew or wilt or have periods of poor foliage. 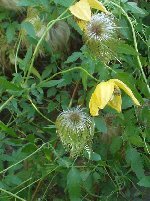 I have a wonderful Bill Mackensie which I think is the best "yellow lantern" type, it flowers for weeks on end and gives a wonderful display of seed heads all through the winter, the seeds germinate readily and even occasionally come up in the garden. Beware, it is big and greedy and will probably damage anything it grows through unless it has some space of its own, mine is on netting on a fence where there are lots of other shrubs about a metre away that it can explore. Another Viticella that does extremely well for me is Margot Koster, I have also seen it growing well in other gardens although it is not very common. It is a good deep pink and has distinctive slightly twisted gappy petals, it flowers early and goes on and on and even after it has stopped flowering the foliage looks tolerable. It is quite small at about five foot and would grace any small shrub that did not provide too much competition. 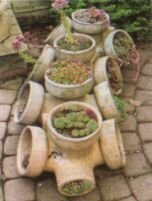 Mine grows up a pergola and gets lots of sun. I know it is heresy to say, but most clematis grow better on their own when well supported without too much competition, they just look better when they grow through other plants as it hides their defects, be it bare legs or scruffy leaves. There is nothing to beat the sight of a Montana in full bloom, I have one growing 30 feet (or more) up a silver birch but they do have two drawbacks, their size and their short flowering season. Both these faults are much improved in the double varieties as they are smaller and flower for 6 weeks rather than 3 weeks. My favourite is Broughton Star which is a pretty, pure, pink. It will grow quite big but you can prune it really hard after flowering and it will recover quite well, I once tried to kill a Marjorie by cutting it right down to the ground and was surprised that it grew back from nothing. Don't try this on a really old Montana as you probably will kill it. The montanas are also the easiest clematis to propagate by cuttings. Clematis have been much improved by the plant breeders and we can't always say that of plants, I hate some of the double daffodils that look like marigolds on sticks. One of the recent success stories is Texensis Princess Diana, it is a great improvement on other texensis varieties as it has excellent resistance to mildew, it flowers early and tolerates drier conditions than most of the texensis - remember they come come from Texan marshland, hardly conditions that most of us can provide. My final choice has to be Huldine, again not very well known, it has to be one of the longest flowering varieties around, it starts in July and most years goes on till November or December. It has a white waxy flower with a faint pink stripe on the back, so it looks good from underneath. I grow mine through rhododendrons which provide an excellent background, I do occasionally check that the rhodi underneath is not suffering. As I get to the end of writing this I realise that I have included 6 not 5, well I would probably drop the Broughton Star but it is a cracking plant! 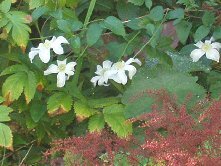 Most of the above clematis are readily available from good garden centres, I find the best source of more unusual varieties is from mail order suppliers, either by visiting them or by mail order, look in any garden magazine or the internet for details.